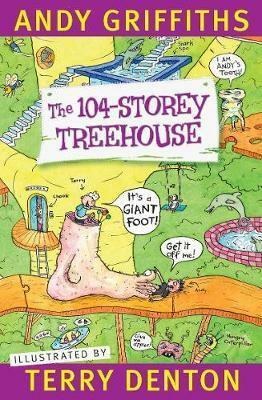 I am a huge fan of the Treehouse books, they are excellently irreverent in a Pythonesque way (I have definitely seen a giant foot in amongst Terry’s drawings!). For those who haven’t yet been introduced to the phenomenon, Andy and Terry, the author and artist, live in a 104-storey treehouse and spend their time trying to write their books and get them to their publisher, the always-angry Mr Big Nose, by the deadline. They don’t really mean to save writing and drawing their books until the very last minute; it’s just that things keep happening to them! Like all good double-acts there is a funny man – the puppy-like Terry – and a long-suffering straight man – Andy. Jill, their animal-loving neighbour, is the sensible one, although I’m not entirely sure you would call someone willing to do surgery on sharks ‘sensible’. In The 104-Storey Treehouse, poor Andy has a toothache and can’t write. So, the two men and Jill get all mixed-up with a special joke writing pen, tooth-fairy money and climbing Mount Everest. Between the story and all of Terry’s tiny and crazy illustrations, this book guarantees hours-worth of re-reads! This is, hands-down, the best book on budgeting, time management and oral health for all kids aged 5-104.